Would you believe me if I told you I made the rug in the picture, and it only took about two hours? I am in LOVE! It is my new favorite thing. I love it from every angle! I feel like it pulls the whole room together! Update: To see me demo live on Studio 5, click HERE. I have been wanting a rug for my formal living room for quite a while now, and have been crazy about the ikat (pronounced, ee-kot) pattern. These rugs are all over the place, but have a very lofty price tag. 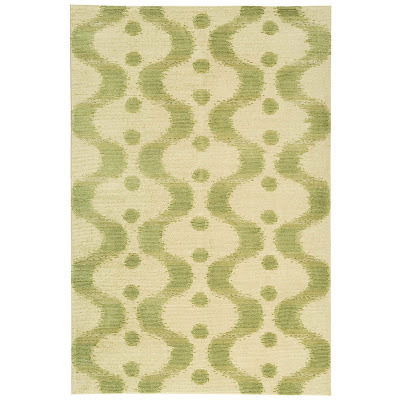 This Martha Stewart rug from gluefier is $468. Ikat rugs in Pottery Barn start at $999. The way I feel about it is; Ikat is very trendy and I love it now, but don't want to make an investment in something that I may not be crazy about two years down the road. I saw a tutorial online about how to make a rug, using fabric, so I thought I would give it a try. The tutorial can be found here. They have so many lovely fabrics to choose from, and have a terrific selection of ikat's (if you are a little obsessed, like I am). I highly recommend them for any project you have in mind, that involves fabric! 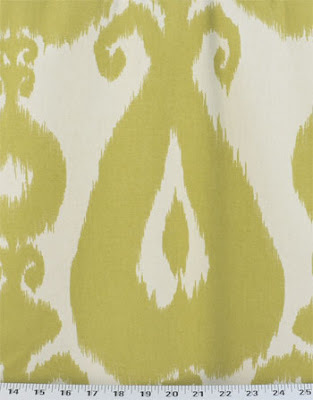 It's called Iskander Lime, and it is fabulous! I ordered 2 yards, equaling $32. Make sure you get at least a medium weight upholstery fabric. I was also sure to use a fabric with a large repeat. This will give your rug a more high end feel. So, the whole thing costs around $72. I used thread I already had to sew the edges, but you may need to factor the cost of thread in there as well. The first thing you need to do is iron. I spent nearly an hour on this part! You will want the fabric to be as smooth as it can be. I left it on my railing while I prepped everything. Lay the rug gripper out on a flat clean surface. Lay the painter's canvas on top of the gripper. Lay the fabric on top of the canvas. I laid mine so the salvage edge barely hung over the canvas, so that I could turn and sew it to finish the edges. Cut the excess around the fabric. Two of the sides will look like this. You will need to fold the fabric in half, and cut the base in enough that the edges of the upholstery fabric will wrap nicely around the base when it's time to sew the edges to finish the project. Now it's time to start spraying the adhesive on. Fold your fabric in half, and start spraying a 6 inch section near the folded edge. Spray on the canvas. Don't spray too much. Use your hand to smooth out the fabric layers. Work your way down, constantly smoothing from the center to the outer edges. After you have finished the first layer, you can do the same for the next layer, but spray on the canvas instead of the gripper. My gripper moved a bit with the smoothing, and probably because of the slant of my driveway. Next, you get to turn the edges. The tutorial I read before recommended pinning, but I didn't actually need to, because of the spray adhesive making it stick on it's own! I had a hard time figuring out how to sew the edges, because of the scale and weight of the rug. I ended up rolling the rug, and setting the rolled end on the chairs next to me, and in my lap. I am not going to lie. It was hard to push it through the machine, because of the gripper. I did break one needle on a corner. Next time, I would sew it with the fabric against the table instead of the gripper, because it runs much more smoothly through the machine. I sewed an extra line of stitching around the edge. I wouldn't recommend this rug for high pile carpets. 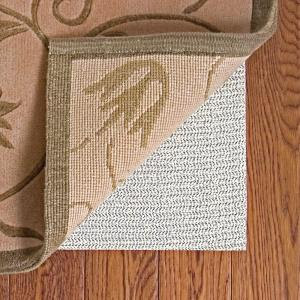 I think it would do best on hard floors, like wood, tile or laminate, and it works well for low pile carpet. Here's how it looks in my house!!! What do you think? I love how it goes with my chairs!!! I love everything about it!!! It makes the whole room! See that lamp? I am going to tell you all about it soon! Also, I will be sharing this on Studio 5 on Wednesday. Tune in for a live demo. Our fabulous friends at Warehouse Fabrics Inc. have a special for Studio 5 viewers that I will tell you about on air. You won't want to miss it! Be sure and come back! Wow. You are such a go-getter. I love it from every angle too! Beautiful! YOu've done it again! LOVE it! I love it, great job! And I love the paint color in that room, do you mind sharing what it is? We go to the same Home Depot, they really are great people there! Thanks for a great tutorial. I may have to give this a try to cover the fingernail polish my 3 year old spilled on the carpet. Your rug looks great in the room! Quick question- would it be alright to wash this rug in the washing machine? Or would that ruin it? Mindy, I don't know what the color is. I painted it almost 5 years ago. I will see if I can find the samlpe. :) Carissa, I don't know if I would wash it or not. I don't know what it would do to the adhesive, and if the fabric shrunk, it might pull everything funny. Hope that helps! This is pretty cool! I had no idea you could make your own rug! Oh my GOSH, this is gorgeous, and YOU are amazing! Wish I had the "hutzpa" to do it! I was wondering how well has it held up? I've been playing with this idea. Love the end product by the way, very classy. Beautiful, you should be so proud of yourself. Good idea, but next time try the double sided iron on stuff that they sell in the fabric department. 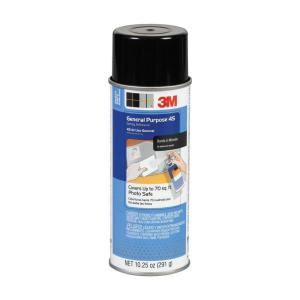 It may hold up a little better than the spray adhesive and workout the odors. Hello, I am not sure, as I haven't tried it before, but maybe you could use double sided adhesive tape? Good luck! Let me know if it works. Wow. I Love all of the colors that you put in this room. I feel like this is a happy room! ;) The room is beautiful. This is brilliant. I wish I had seen this when I moved into my new apartment! Definitely pinning this so that I can use it for future decorating. If nothing else it would be perfect for staging! It is a great idea...maybe spray it with Scotch Guard to repel stains. Looks great. I would add to then spray it with fabric protector. Force Field is the brand I like best and is sold at Hancock's fabric and other fabric stores. Best price is Hancock's. Test on scrap of fabric first. 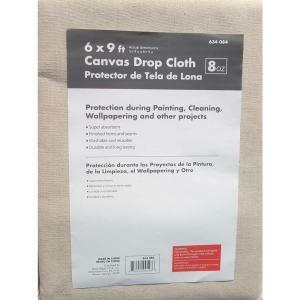 But I use this on all upholstered pieces and even on rugs for my front porch that are not outdoor rugs. Protects from dirt and even red wine spills. So great to know, thanks!